I may be partial to Williams’ poetry, because he’s “one of our own”; that is, he’s from northern New Jersey. Williams wrote about familiar places—the city of Paterson, where my paternal grandparents grew up, where my father born. In fact, the edge of Paterson (once considered a beautiful city, more of a slum today, such a shame) borders my current city of Clifton, New Jersey. Williams also wrote a collection of short stories called Life along the Passaic River, another landmark close to home. But more than that, Williams truly was one of the most prominent poets during the “years between the wars.” A physician, Williams was known for scribbling poetry on prescription pads. When I studied Williams as an undergrad I was taken by his short, fleeting nonconventional (it was popular era for nonconventional poetry) poems that seemed to be lacking in broader, more abstract notions. In fact, Williams once said his poems were “No ideas but in things.” The concrete aspect of his words, the odd formation of his words, and the brief, one second it’s there, one second it’s gone nature of his words helped give Williams a name of his own. Two of my favorite poems by Williams are written below followed by a brief analysis. “The Red Wheelbarrow” is from 1923, and “This Is Just to Say” is from 1934. I don’t believe there is too much to say here. Perhaps it signifies the things we take for granted. Most people don’t think twice about a wheelbarrow, but in fact, much labor could not be done without it. The seemingly innocuous inanimate objects are necessary than we think. I wonder about the use color. Why red? Chickens are generally white. But what is there place in the poem? And what about the odd format? Some believe that the poem is meant to do nothing more than to put a quick, strong image in the mind of the reader. An interesting one. I always saw it as a note someone left on the refrigerator. Of course the mystery is who left for the note for whom? The confession—which is essentially what this is—doesn’t express much sorrow or regret. In fact, in parts (“Forgive me”) it’s quite demanding. Perhaps a greater notion here is the fact that these plums are only good for a while. These types of things do tend to spoil quickly. Maybe there is a lesson in here. Waiting too long to take advantage of life’s pleasures may result in regret—even if you are stealing someone’s plums. Two poems that say little, but express much—or don’t express much. Do you have your own interpretation? I’d love to hear about it! I had a professor in college who once referred to Frost’s poetry as “simply complex.” It’s not a bad description, actually; Frost’s writing is clearly stated, accessible, and identifiable, yet there’s more beneath lurking beneath the surface. In that sense, Frost is often misunderstood . His plain spoken, nature-loving words often come across as adages in stanza-form, all bound up in a perfect poetic package. Surely though, such a prolific man of literature goes beyond Dr. Seuss for adults. There are dark undertones to Frost’s poetry. In the poem entitled, “Stopping by Woods on a Snowy Evening” the familiar last line (repeated twice), “Miles to go before I sleep,” doesn’t necessary mean that one must keep going in order to pursue her dreams. The scenario in the poem is a man riding his horse through the woods in sub-zero temperatures; hence, if he “stops” he will likely perish. “Sleep” then becomes synonymous with death. A much darker premise for a poem than simply not giving up on dreams. Of course, there’s a more specific life metaphor in there somewhere. My point is that not all Frost poems are what they seem. March to the beat of different drummer. Follow your own path. Make your own way. This is what a surface reading of the poem demands. And while most seem to grasp that a the “road” metaphor is meant to suggest life in general, the poem, taken into consideration, is rather vague, ambiguous. Certain symbolism must be taken into account. In the first stanza, the woods are described as “yellow.” In poetry, yellow is a color that often carries negative connotations. Does this have significance? Maybe, maybe not. Is this to suggest that the two roads weren’t all that different in the first place? When faced with a life decision, we truly can only go one way, isn’t that true? We’ll never know what might have been. We can promise ourselves to try both ways, to come back and test out our alternative options, but the truth is, how many paths can we really follow? What do we lose each time we make a choice to go one way and not the other? Then, in the first line of the last stanza, the word “sigh” suggests regret. “I shall be telling with a sigh/Somewhere ages and ages hence.”Don’t we worry about that old notion of waking up one day and realizing what a waste our lives have been? All the missed opportunities, fallen chances, and failures? Does this “difference” he speaks of necessarily mean better? Of course it made a difference. No matter what choice we make, it made all the difference. “The Road Not Taken” then, as it says right in the title, could be a lamentation or at most, a mystery. Something we’ll never know, never grasp, because life will only allow us to follow one path at a time. Got to love poetry with all its layers! This by the way, is my first in a short series of “Old School Poetry.” Hope you liked it! This magnet has been on my refrigerator for years now. Many times I’ve stopped to read it, reveling in the perfection of its rhyme scheme and Irish-sounding maxim. It was given to us by a friend, who likely picked up my husband’s half-Irish pride. I too, have some Irish blood mixed into my “mutt-like” ethnic background, but I’ve always been able to identify with their culture. Throughout history, the country has survived some less than “lucky” periods. Yet its people have somehow remained some of the grateful in all the world. There is a clinging to pride among the Irish, and a kind of zeal that simply cannot be broken. I don’t think I’ve ever met an Irishmen who wasn’t more than happy to boast of his heritage. 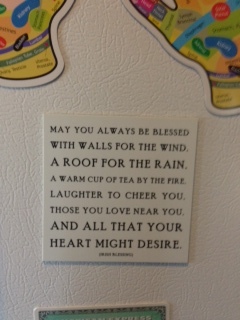 One night last week, I passed by refrigerator in my usual fashion and for some reason, decided to pause and read the delightful words on the magnet. And then? Well, I don’t know what happened exactly, but I started to…cry. A WARM CUP OF TEA BY THE FIRE. I cried because I’ve been driving myself crazy with all that I don’t have. I don’t have a house in Bergen County. I don’t have an agent. I don’t have a publisher making me a star. I don’t have a slot on the New York Times Bestseller List. I don’t have as rockin’ a body as I did high school (if I even did then). The list goes on. But that magnet? It put things in perspective. It was like an epiphany. Here’s a country that has gone through so much torment, so much struggle. It’s true. Having a warm home, good people and laughter in your life, (and of course tea and a fireplace 🙂 ) really is a blessing. Think about how more than half of this world lives. I have all those things. Well, not a fireplace, but I grew up in house that had one. It hit me so hard and I didn’t even see it coming: I’m blessed. If I never get any of those things I mentioned above, I’m still blessed. Doesn’t mean I won’t try of course, and that in and of itself, the fact that I’m able to attempt my dreams, is of course, it’s own blessing. It knocked the stress right out of me. Maybe if we all stopped wanting we could calm down as well. And in my opinion, inner-peace is the root of happiness. I mentioned that my purpose in dedicating the next several Old School Sunday posts to the Bard is to enlighten my readers about the ubiquity of Shakespeare’s words–even in our own day and age. Last week I was able to tie a line from King Lear to Hurricane Sandy. This week, I feel strongly compelled to link Shakespeare’s wisdom to the tragedy (though I hardly think the word ‘tragedy’ does the situation justice) that occurred at Sandy Hook Elementary School in Newtown, Connecticut. “Men/Can council and speak to that grief/Which they themselves not feel; but tasting it,/Their council turns to passion” (5.1 20-3). I’ve been witness to several media stories of mass shootings in my day (I was a high school student when the Columbine incident occurred, making the notion of something like that happening very real), and though ALL of these occurrences are beyond horrific, I simply haven’t been able to separate myself from this one. This is something that is felt by anyone who is a parent. By anyone who is a teacher. And more than that, anyone who is a human being. We all attended kindergarten, first grade, etc. In other words, we’re all tasting this. May all the victims, families, and residents of Newtown find peace. I’ve decided that for the next five Sundays…or at least until the new year, I’m going to dedicate my Old School Sunday posts to The Bard, himself, William Shakespeare. I read King Lear in college. Such a powerful story of hubris followed by a complete unraveling. After all, isn’t a mental breakdown usually an appropriate punishment for excessive pride? Doesn’t it always follow? At least in literature. I’ve been amazed by Lear’s pomposity, and impressed by his lovely daughter Cordelia’s earnest answer of ‘Yes, father, I love you, but not anymore than I should.’ There’s nothing more drastic to the ears of the grandiose than the good old, honest truth. There are many memorable lines I could pull from this play. But there was always something about this one that I could relate to my life on a number of different situations. “And worse I may be yet: the worst/is not/So long as we can say ‘This is the worst'” (4.1 29-30). Being from New Jersey, I can attest that the recent storm, Hurricane Sandy, was perhaps the ‘worst’ our state has ever seen. We lost our favorite vacation spots. Many of us lost heat and power. Some (too many) lost their homes. Some lost family members. Others lost pets. We waited on long lines for gasoline, something, we all learned, we’d taken for granted. But we’re “Jersey Strong” and resilient. And we’re all aware of the fact that we’re damn lucky we can still say that Sandy was the worst storm in our history. Because if it was truly the worst…we might not be around to even suggest it. See? We can all learn a thing or two from Shakespeare. There aren’t many words to describe the prowess of Ms. Jlee…you need to go check it out yourself. This blog is as entertaining as Las Vegas; it never bores, because there is way too much see, read, look at, laugh at, and love! Jlee writes a myriad of product reviews, hilarious “Bad Mom” excerpts, and other day-to-day quandaries and conundrums. What’s more, this blog includes a section called “Deep Thoughts by Jlee,” quick, ironic, satirical ‘wisdom’ that can only come from the mind of a verbal genius. If that wasn’t enough, a visit to this blog will dazzle you with stories of “The Chiquita” (Jlee’s fabulous nickname for her daughter), passages from Concrete Boots, a book in progress, and lastly, a fairly new feature known as “Lighten Up,” which I won’t reveal anything about, because you simply must read the hysterical TRUE story for yourself. This is seriously one of the most unique blogs I’ve ever come across, and Jlee’s personality comes across the virtual pages tenfold. I’ve never met Jlee in person, but I can tell from her blog that she’s someone I’d love to go have a drink with! 1. Tell me three things you carry with you. I’ll go beyond the obvious here, meaning cell phones, wallets, purses, etc. I’d like my answer to the question to have more value than that. I debated if this meant physical things or mental things, but to avoid being too cheeky, I’ll stick to the physical. (1) Mace /Pepper spray. I watch waaaay too many real life crime dramas, and due to my regular night classes, which I both teach and take, this gives me a sense of security. (2) Lipstick. As I get older I have more and more faith in cosmetics, and there’s just something about wearing lipstick. It completes ‘the face,’ makes you feel like you’ve completed the make up process, and while daily touch ups aren’t quite as satisfying as the initial coating, it’s still refreshing. (3) A photograph of my paternal grandparents circa 1992, standing on their front stoop distributing Halloween candy to a slew of neighborhood children. I’m not sure what it is about the picture that moves me so much, but it makes me feel warm inside. During stressful days, I like pull it out of my purse and gaze at it, as it brings me back to my childhood, and reminds how deeply good they both were/are (Grandma passed last October, but thankfully Grandpa is still with us). Beyond babysitting, it was at a small, individually owned publishing company run by one owner and one secretary. The company, called “Calsun Publications” printed a yearly directory of local businesses. The company was situated in my hometown, and one summer the owner called the head of the English department at my high school, and asked her to recommend an honorable, intelligent, responsible student (me!) for a summer gig. I did a lot filing and faxing. I was fifteen. I walked there and back everyday for an entire summer. I like them. I’m not sure if they are ‘in style’ or not–I’ve actually wondered the same thing. Because in some ways, they make me think of my beloved, yet old school Full House and Saved by the Bell characters, but on the other hand, denim is always classic…except for the jacket, oh and the infamous “Canadian Tuxedo” look. I never wear them though, because my thighs rub together. My sister is the skinny one. I’m the curvy one. I can’t imagine what it’s like to feel air between the thighs. OK. TMI. 4. What planet would you travel to if you could? I would pick Neptune because of it’s azul blue color. There’s nothing to me like deep blue–any shade of blue for that matter. Neptune, though I’m aware that it is freezing out there, has a deep, ethereal quality to it that reminds me of peace. 5. What is your favorite piece of modern technology and why (microwave, DVR, computer, etc.)? Although I love the Internet and my iPad, I’m going to go with modern HVAC (heating, ventilation, air condition) systems and of course, plumbing. In the long run, I’d choose a hot shower and indoor bathroom over playing a game of Angry Birds. 6. What super power would you possess if you could pick one? This one’s easy. Invisibility. I could spy on people, listen to conversations, and get away with illegal activities such as vandalism (though I’d only go after those who had wronged me). Plus, I could hide from the bad guys. See, told you I watch too many crime shows. 7. Tell me the last dream you remember having. I was on the beach with some friends, and I was slowly inching towards the water. I felt afraid to swim in vast ocean, but I was determined to try. I stopped short when I noticed a huge wave forming–but not in the center like it usually does, this wave was coming from the left hand side of the ocean. I started running towards the shore and people were screaming. The wave washed over me and crashed at my feet, but it didn’t knock me down. I was drenched, but still standing. 8. What TV show can you watch reruns of over and over and over? 9. Do you agree with how others see you or do you think there is more than meets the eye? Some people seem to get it right, but others are way off. For the most part, I’d say there is more than meets the eye. I’m a fairly reserved person, introverted, etc. I’m an example of that old adage, ‘Still waters run deep.’ There have been people in my life that have truly screwed me over based on pure misunderstanding of who I was, and what I was capable of. 10. What is your astrology sign and do the characteristics fit you? I am a Libra (b. Oct 17), and yes, many of the classic Libra traits do fit me. I take forever to make a decision, and abhor conflict. I avoid it at all costs. I’m a born diplomat; I always see both sides of any situation. My take on most controversial topics is fairly moderate, and I’m consistently either on or off balance–just like the scales. I also crave beautiful surroundings. 11. Are you right handed or left handed? Right handed. My left side is pretty much useless. 1. What’s your favorite flower? 2. If you could go back in time and see one artist or band LIVE in their prime, who would it be? Why? 3. What’s the meanest thing you’ve ever done to someone? Do you regret it? 4. Name five celebrities you’d kill if murder were legal. 5. Name three or more celebrities people have said you look like. 7. What is your favorite time of day? Day of the week? 8. What is your favorite emotion? Least favorite? 9. What was your favorite age? Or, the best time in your life? 10. What parts of your body hurt the most? 11. What is your greatest vice? And….finally, the time has come to announce eleven, err, seven worthy bloggers of the next round of almighty Liebster Award! Thank you again to Jlee @ http://jleesblog.com I’m so excited to be part of this award, and of course, to spread the blogging love. Over a year ago, around the time I began composing my novel, I dreamed of seeing a paperback with the book’s title etched across the front cover lying amidst a plain, white background. I felt so excited in the dream, so accomplished. It seemed real, somehow. Feasible. Not without a ton of work, of course. But I awoke feeling relieved. Maybe it does matter that I do this, is what I thought. Last semester, in my final pre-thesis graduate course, my professor, in response to reading my proposal said she was highly impressed that I’d written an entire first draft of a novel. “It must take a lot of confidence,” she said, “to know that you can do that,” (I apologize if I’ve misquoted). I had never looked at it that way. Certainly there were some days when ‘confident’ was the last thing I felt in terms of writing the story. But on deeper reflection, I found that the three D’s–desire, discipline, dedication–despite sounding like something off a motivational poster, is in fact, the recipe for confidence in writing, in any endeavor, really. There aren’t a lot of guarantees in being an intrinsic writer. I have to remind myself everyday that this is something I have to do, whether it amounts to anything or not. Underneath the frustration, the labor, and the self-torture lies a kind of quintessential joy that emanates through my fingers, onto the keyboard, and finally the page. It is important. Know that. Believe it. And I encourage all of you intrinsic types to keep writing. Because it does matter that you do.